Add grated cucumber, wheat flour, rice flour, curd, chillis, chilli pwd, haldi, ajwain, tilli, coriander , salt in a big bowl and mix well.The consistency should be slightly thicker than the dosa batter. If needed then add some water. Heat the nonstick pan or tawa. sprinkle some water drops on tawa then take a big ball of mixture and put on tawa and then by wet hands spread the mixture evenly like chapati.The thaalipeeth will be better if it is a bit thinner. Then put some oil from all sides and put lid on for 1 min or so.then flip other side and simmer the flame and cook for some more time. 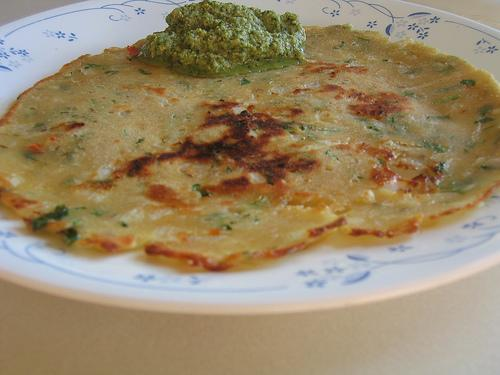 The thalipeeth is best served with thecha or pickle. hi nancy, Thecha is actually a kind of chutney prepared with green chilli and dessicated coconut...i think u can find its recipe on the site. WILL TRY TODAY BUT WHTS "THECHA" ?